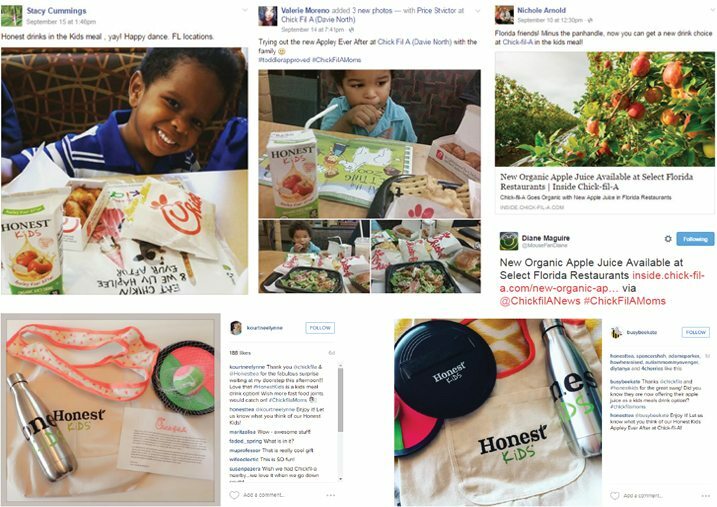 BSM Media partnered with Chick-fil-A to increase Mom engagement and feedback. We put together a group of Mom ambassadors to participate in the Chick-fil-A Moms Panel, which was responsible for testing new products and communicating with the brand and their followers. Our Chick-fil-A Mom Panel participated in testing, reviewing, and sharing their Kids’ experience with a new Honest Kids beverage at select Florida restaurants. This product review resulted in over 20,000 impressions. Chick-fil-A hosted a tasting event in Jacksonville, FL on July 19, 2016 in honor of their nationwide rollout of the new Egg White Grill breakfast sandwich. Chick-fil-A Mom Panel Moms were invited to the special event to try this new breakfast menu item for themselves. This also resulted in positive feedback and expanded social reach. At the Egg White Grill Tasting Experience, just 11 posts from the Mom’s Panel generated over 16,000 potential campaign impressions.